Bamboo in Chinese culture represents a good gesture. Bamboo, MUI flower (cherry blossom), orchid and chrysanthemum represent four important personalities for Chinese people. Bamboo is considered one of the “Three Winter Pals” in China. Though it always stands upright and straight, it has the quality of being flexible. Bamboo is easy to flourish. And this implies the idea of good fortune and prosperity. Since bamboo usually gives people a calm and peaceful feeling. At the same time, it is very elegant. 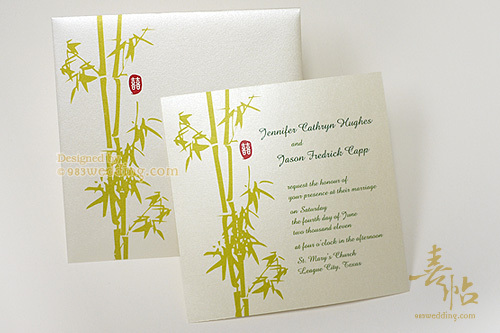 Bamboo wedding invitations will fit couples who prefer simple and elegant wedding cards. 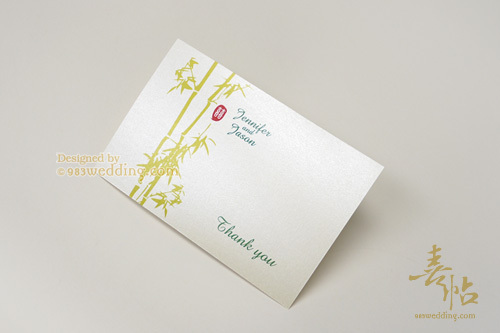 Since the focus of the design is the bamboo, the main tone of this invitation is green. The bamboos are printed in light green while the wordings are printed with a darker green color. However, one of the problems of this color scheme is that the invitation may look very plain and pale. It will be a good idea to add a little bit of bold color. 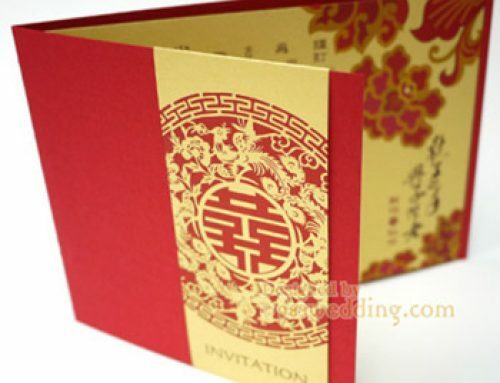 As a result, we add a bit of spice to the invitations by putting a red color double happiness on the right-hand side of the bamboo. Again, the double happiness symbol is presented in the form of a Chinese chop. The design becomes more lively and elegant after the symbol is put on the card. This wedding invitation design will suit your needs if you want a card which delivers a sense of being natural. It will also fit you if you do not want something which is too fancy. 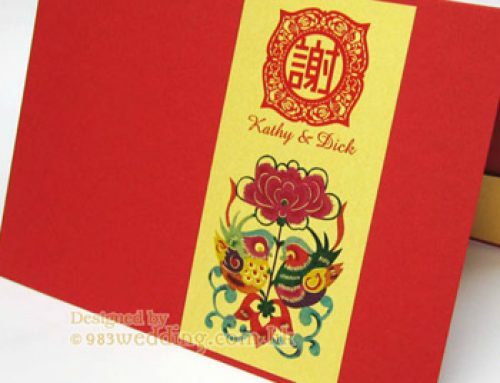 The design can also be perfect if you are looking for elegant Asian wedding invitations. It will especially fit your event if you are going to have a Chinese or Asian themed wedding. Your guests can feel a sense of peace when they see the invitation cards. You may ask what if you are not going to have a Chinese and Asian themed wedding. 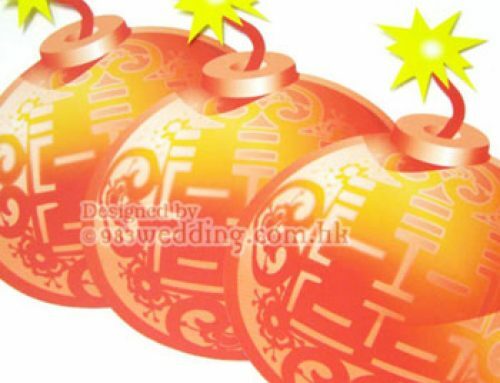 In fact, it can fit different types of wedding themes as the bamboo design can be very neutral if we do not put the red colored double happiness on it. So, please let us know if this is what you need. 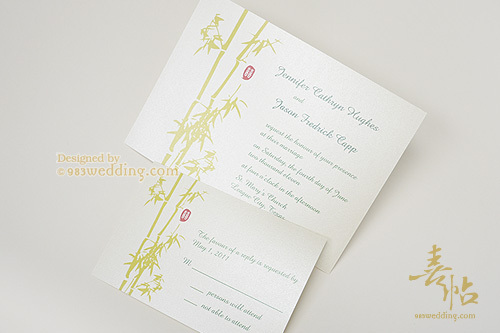 The bamboo wedding invitations are in a square shape (extra postage fee might be required in the U.S.). It is possible to change the size of the card. Changing it to a rectangular invitation is also something feasible. 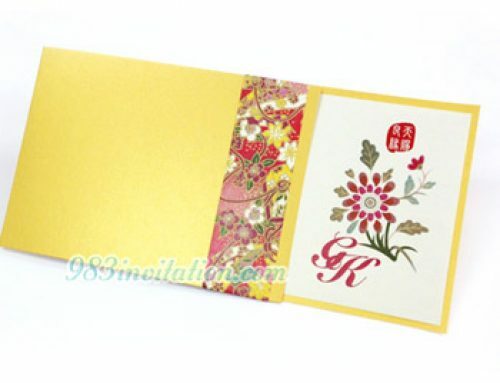 Envelope with the same bamboo pattern will be printed on the front envelope. This makes the envelope also an interesting part of the whole design. 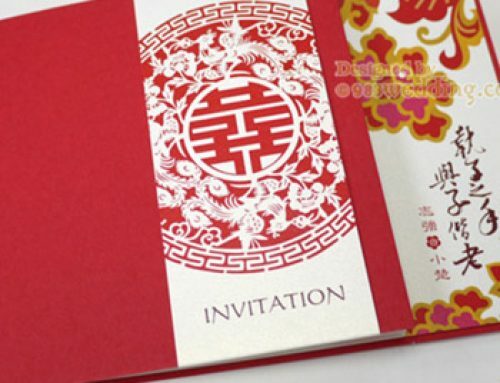 Besides the main bamboo invitation, other stationery items are also designed in the same manner. It is a whole set of stationery you can choose. R.S.V.P. cards and Thank you note could be ordered separately.